Beautiful, natural nails covered with unique shine of pink pearl. Japanese manicure strengthen the natural nail surface, adds beautiful gloss, seals up the nail plate, and provides natural nutrition. The preparation consists of: vitamin A + E, keratin, bee pollen, and silica from the Japanese see. More than for hundred years ago, Japanese aristocracy discovered the secrets of manicure, which provided their nails with delicate gloss of a rare pink pearl. Japanese manicure is recommended especially for nails that are brittle, fragile, splitting and unsmooth. The therapy is based on subtle massage with the use of a nutritional paste into the surface of the nail. The next step is to secure the paste with a layer of powder, which sustains the supplements from the paste inside the nail after it is washed away. As and additional effect, the nail gains an exceptional natural gloss, which lasts as long as two weeks. After the treatment is conducted it is recommended to avoid painting the nail for about 4-5 days, as the adhesion of the polish in this period is strongly limited. It is recommended to combine Japanese manicure with biological manicure, as it fully uncovers the natural beauty of the nails. The treatment lasts about 30 minutes and it should be repeated every 2-3 weeks in order to supplement the nutritional components. The therapy is based on the use of a special liquid, which exfoliate the horny layer of the epidermis, instead of cutting it mechanically. covering the nails and their surrounding with a healing oil MSP. The oil makes the skin around the nail soft, moistened and nourished. In case of heavily damaged nails and unsightly looking skin, the treatment should be repeated in 3-4 days. French manicure is based on conducting classical or biological manicure, and additionally the free edge of the nail is covered with a white polish. The final stage of the treatment is a full covering of the nail surface with a milky or light-pink nail polish. Hybrid manicure is the latest trend on nail cosmetic market. The mentioned treatment, stands for a modern approach to manicure, which provide the nails with a beautiful effect even up to three weeks. The therapy is safe for the nail plate and the nails astonish with their natural look. During the process of hybrid manicure, a special type of products are used – hybrid nail color. Those substances combine the properties of nail polish and light-cured gel. Especially designed pigments provide an easy process of cosmetics application and a wide variety of colors. Additionally, the properties of UV gel provide a long term effect (from 2 to 3 weeks). As a consequence of the treatment, the nail plate is covered with a protective layer. This coating, unlike traditional nail polish, is immune to chipping, as it is exceptionally durable and damage resistant. 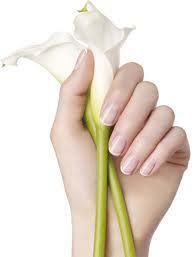 Last but not least, the nails gain a natural looking and aesthetical protection. The gel method prolongs the plate of the nail using a special form (stencil) or a tips glued to the surface of the nail. It is also possible to attach gel to the natural nail, which renders the nail plate stronger and more durable. Procuring a nail through the gel method is based on placing (using a brush) an appropriate layer of gel, and than indurate it with a special UV lamp. 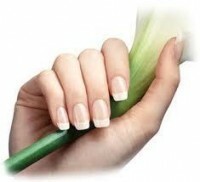 Acryl is the best solution for women with brittle and fragile nails. Curing the nail with acryl, assure a solid structure highly resistant to damage. The main advantage of this method is the fact that there is a wide choice in pattern and color selection, which grants nails with additional touch of character. Moreover, another advantage is that the acryl-strengthened nails are durable and last longer on the natural nail plate. The average duration is equal to about three weeks, when they should be complemented. Acrylic nails are especially recommended for people who bite their nails. Acryl helps to cover all the flaws and surface deformations, and as a result the nail looks healthy and natural. Strengthening of nails with acryl is the best solution for people who bite their nails, it is the easies way to quit the nasty habit. Thanks to the acryl, the surface of the nail becomes hardened, which protects the natural nail and successfully prevent the owner from biting the nail. As an additional advantage, the damaged natural nail has the chance to regenerate and rebuild it structure up to full recovery. Paraffin bath is a professional treatment meant especially for rough and dry hands, the formula is based on biologically active whitening acid and silk. Paraffin recovers the natural velvet softness of hand skin, which is exposed to negative factors on a daily basis. The treatment smoothens and moistens the epidermis and enhances the condition of nails. Additionally, paraffin therapy detain the natural ageing process, remove discolorations and prevent pigment spots from appearing. It eases skin infections, enhances blood circulation and strengthens connective tissue. 1. Softening Cream – retain moisture inside skin, additionally deeply moistening the dry areas of hand skin. Softening the thickenings of the epidermis. The cream is applied on clean hands, covering whole skin surface with special attention focused on delicate skin between fingers. 2. Cleaning Peeling – made of apricot pit it purifies and removes old epidermis layer, immediately creating the feeling of soft and fresh hands. It also removes thickenings and smoothens the skin. Placing a fair amount of peeling cream on hands, we begin a thorough in massaging process. Afterwards, the cream is washed away with warm, running water and the hands are dried carefully. 3. Regenerating Cream – a perfect moistening and nutrition of skin. We apply a fair amount of cream through the process of careful hand massage, paying special attention to the top of palms. After the treatment is finished, the hand skin immediately becomes satin soft. The treatment may be repeated together with all manicure therapies.